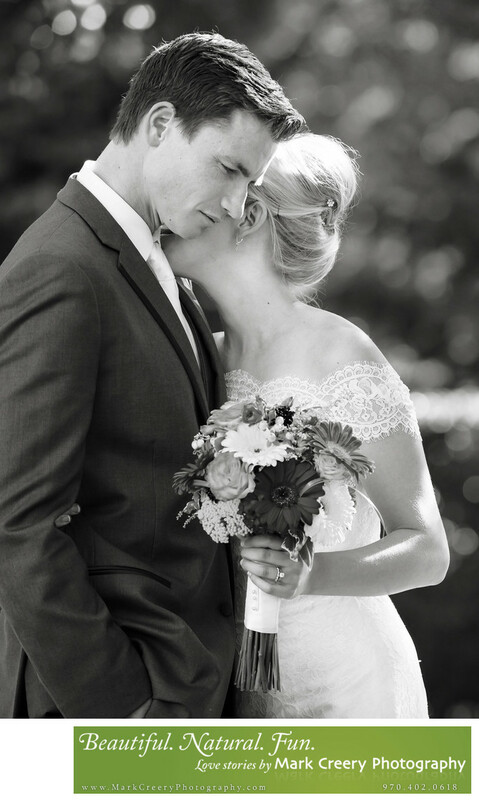 This candid wedding photograph taken after the recessional show an intimate moment between the bride and groom. Although it looks like it could be staged or scripted, I stayed away from the couple and zoomed in with my telephoto lens so as not to disturb the sweet moments that happened between them before their family arrived to congratulate them. I chose to show this image in black-and-white to highlight the soft emotions of the image without distraction of the greenery in the background. The Broadmoor Hotel is an elegant, luxurious wedding venue that can cater to weddings of any size - from 20 to 1000! They even have their very own chapel, and with 5,000 acres the resort provides lots of space to roam around. The lakes have a serene beauty that is perfect for romantic wedding photography with many paths to walk around. Ceremony locations include Cheyenne Lodge Terrace for 150-250 guests (also a reception venue), the Fountain Room (150-250 guests), Lakeside Terrace (300 guests) with dining room for the reception, Mountain View Terrace (150-250 guests), Pauline Chapel with room for up to 90 guests, South Terrace (up to 60), West Tower Lawn (from 20-1000) and multiple reception options, West Terrace (50-150 guests), Fish House (2-24 people), Ross Room Terrace (50-90 guests), and The Estate House Lawn (2-200 guests). Additional wedding reception venues include Broadmoor Hall (the largest venue at 400-1000 capacity), Rocky Mountain Ballroom (200-500 guests), the Donald Ross Room, Dow Finsterwald Room, Main Ballroom, Penrose Room, Remington, Schreyvogel, West Ballroom, and The Estate House. So many upscale and refined options to choose from. The Broadmoor Hotel & Resort is located in Colorado Springs, Colorado. Contact: Lindsey Suggs, (719) 577-5880, lsuggs@broadmoor.com. Location: Broadmoor Hotel, 1 Lake Avenue, Colorado Springs, Colorado.